What's in Your Water? High Arsenic in 1 in 5 NH Wells. Wells in New Hampshire can contain any number of colorless, odorless chemicals. The three most common in descending order are Arsenic, Manganese and Radon. 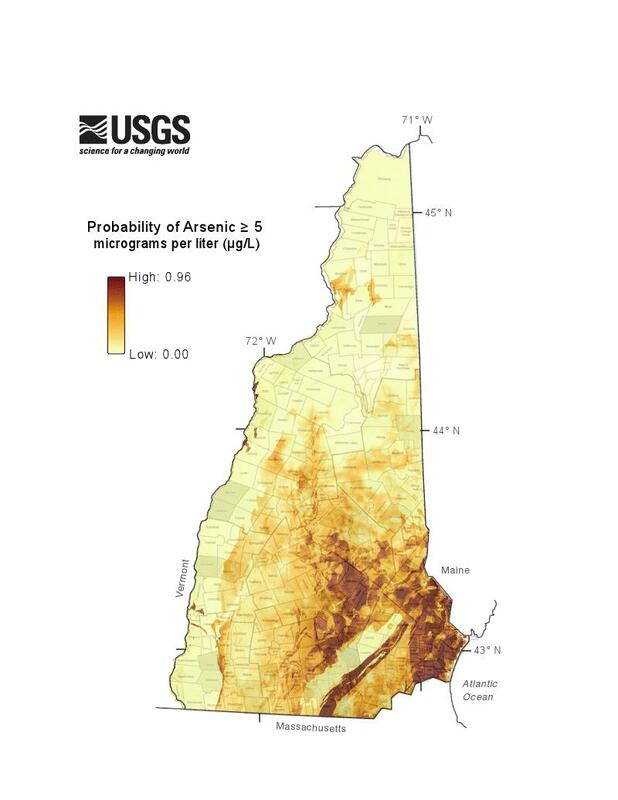 This map estimates the probability of finding arsenic in a bedrock well. DES says even if you aren't in an area with high levels of arsenic, it's possible that other contaminants like radon or uranium are in your water. About 40 percent of New Hampshire residents get their drinking water from private wells. The Department of Environmental Services is encouraging well owners to test their water for arsenic, but unlike municipal water supplies, testing isn’t mandatory. And colorless, odorless contaminants abound in the Granite State. There’s nothing quite like a cool glass of fresh-drawn New Hampshire well water… or is there? Classic movies have taught us that there are certain things you’d just rather not drink. Josephine Hull: The gentleman died because he drank some wine with poison in it. Cary Grant: Well how did the poison get the wine. Jean Adair: well we put it in wine because it’s less noticeable; when it’s in tea it has a distinct odor. That’s from the 1940s Cary Grant version Arsenic and Old Lace. In real life, there is no distinct odor from Arsenic, and it’s no laughing matter. Studies from the US Geological Survey show that about 1 in 5 domestic wells in New Hampshire have elevated levels of arsenic, and New England has higher concentrations than most places in the nation. Chronic, low-level exposure to arsenic has been linked to increases in bladder, lung, skin, cancer, and cardio vascular disease. That’s something Christine Bowman of Concord knows well. She works monitoring municipal water quality for the Department of Environmental Services, but her own home is not in the city limits, and her well-water has arsenic in it. To install a system to get that it out, wasn’t cheap. Bowman: the total cost was around $3,000 dollars. And that expensive filter only got all of the arsenic out of their water for only a few years. Bowman: it’s kind of a slow breakthrough process, so it’s not like a lightswitch where it can’t take up anymore and it’s gonna let it all through. Because she’s a water professional and knows these things, Bowman kept getting her water tested periodically, and after about 4 ½ years, the arsenic started to show up at the faucet again. So Bowman and her husband added an under the sink filter that would clean just their drinking water, which they installed themselves for about $350. Bowman: it goes up to a dedicated faucet that is installed next to our typical faucet. Bowman is pretty savvy about all of the various contaminants that can creep into New Hampshire ground water out of the bedrock – Radon, Uranium, Manganese, and of course Arsenic. She’s vigilant about testing their well. A lot of others aren’t. Sharon Burston lives in Epsom, and depending on the day, her well water can have more than twenty times the recommended levels of arsenic. After she and her family moved here, Burston –who spent the most time at home – started to have symptoms of heavy metal poisoning. She lost her hearing, had numbness and tingling in her limbs, and developed allergies suddenly. When she went to doctors, they told her the symptoms were “idiopathic,” or basically random. Burston: if there’s ever a word that you don’t want to hear it’s, “it’s idiopathic,” because that’s doctor speak for I haven’t got the foggiest idea of what’s wrong with you and I don’t intend to make any efforts to find out. It took three years to figure out that Arsenic was to blame. She says she’s now on her third filtration system, but she’ll never make a full recovery from the nerve damage done by the arsenic in her water. Burston: I still worry, I worry about my daughter, I worry about all the things that she’s probably predisposed to because of having… living in a house with arsenated water most of her childhood. According to the DES, while we don’t have complete data on the topic, it’s clear that most New Hampshire well-owners don’t test their wells frequently enough. Many wells have never been tested at all. DES wants that to change. They say, they can’t make well-owners do so, but they can ask: test your water, you never know what you’ll find. Cary Grant: Yeah A. A as in Arsenic. Got that? Sun, salt and lime sounds like the beginnings of a cocktail recipe, but for some, it could mean cleaner, life-sustaining water. In many developing countries, the only source of water is contaminated with viruses and bacteria. 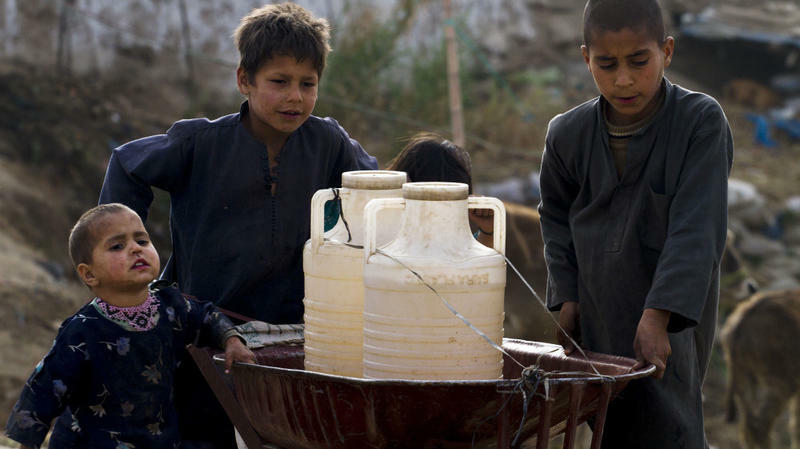 In fact, the United Nations estimates that 1 in 6 people don't have access to enough fresh drinking water.